An overview of major American art museums including New York’s Metropolitan, San Francisco’s de Young, Houston’s Menil Collection, Chicago’s Art Institute and 156 others. The guide is a tribute to America’s art treasures, and the many people involved in creating our art museums: collectors, architects, patrons, curators, professors, museum directors and others. Today, America’s art museums are the best available record of the country's architectural heritage. America’s Art Museums provides vital information on each museum’s history and the often peculiar manner in which it was established. The guide is useful for on-site visitors and fun for armchair travelers. 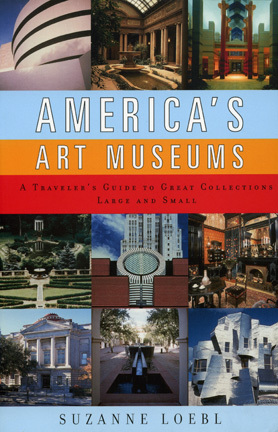 Special sections provide a history of art museums in America, tips on how to visit museums with children, and a retelling of the story of Samuel H. Kress, the 5 & 10 store czar who donated more than 300 works of art to innumerable museums. in any form without permission.